The Gamo Varmint Air Rifle is a .177 Cal pellet break barrel able to shoot up to 1250 fps using PBA Platinum pellets. 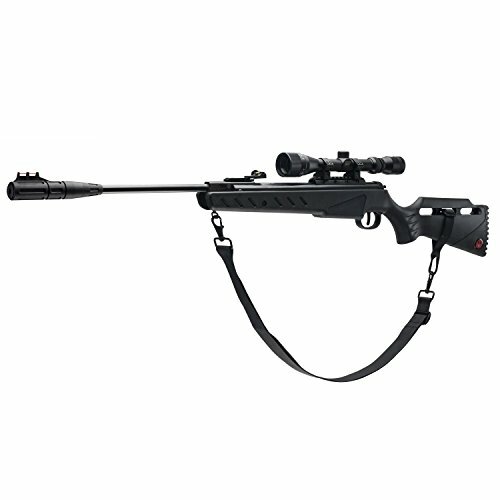 This air rifle is ideal for pest control: nuisance animals such as mice, rats, birds and snakes. Also perfect for recreational shooting and other everyday uses. Features: Single cocking Break Barrel, Automatic cocking safety system, Manual trigger safety, Fluted polymer jacketed steel barrel, Standard trigger with adjustable second stage, and a 4x32 shockproof scope with mounts. Weight 5.74 pounds. 1-year warranty. Made in Spain. ITEM 6110017154. The Ruger Air Hawk is a 1000 feet per second pellet rifle with a single-shot cocking mechanism. This spring pistol break barrel air gun has a rifled blued barrel and receiver and is crafted with dark hard wood that is sleekly formed into an ambidextrous stock suitable for both right- and left-hand shooters. The Air Hawk rifle is equipped with fiber optic sights, an adjustable trigger, and a muzzle brake. 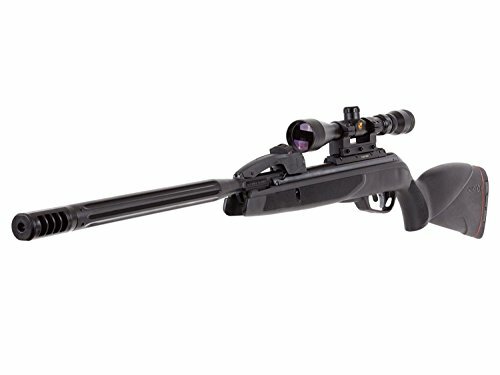 When you shoulder this Ruger Air Rifle, you'll notice a comfortable grip, a conveniently placed automatic safety and a rubber recoil pad. The Ruger Air Hawk also comes with a 4x32 air gun scope that is made to withstand the double recoil action produced by air rifles. For a new generation of shooters who like the adaptability of the AR platform, the M4-177 is sure to impress. Featuring a rifled steel barrel, the M4-177 shoots both pellets and BBs. This variable pump rifle features valve technology that combines lower pumping force with higher velocities. The rifle's variable pump action is easy to use for right or left-handed shooters and velocities are exceptional at up to 625 with pellets and a swift 660 fps with BBs. The various Pica tinny rails allow you to mount your favorite accessories. Built in America. The new Crosman Fire breakbarrel.177cal rifle is powered by a Nitro Piston that shoots up to 1200fps with alloy ammo and is ready for your next excursion. It is built with synthetic, all-weather material, making it a practical choice for the avid outdoorsman. The kit includes a CenterPoint 4x32 precision scope for superior accuracy and target acquisition. This product has an ambidextrous safety, so both right-handed and left-handed users can fire with ease. The Fire has a safety that can be used when shooting on the left or the right. Don't forget to purchase safety glasses and Crosman 177cal pellets!. Single shot variable pump BB/pellet rifle with all weather synthetic stock and forearm. Fiber optic front sight. Includes safety glasses and 4x15mm scope.